The key guy in putting together Bill Clinton’s endorsement of Gavin Newsom for governor is a 30-ish, big-time California political fundraiser named Yashar Hedayat, campaign insiders say. Hedayat, who often travels with the San Francisco mayor on the campaign trail, is personal friends with both the Clintons and was a major bundler for Hillary’s presidential bid. 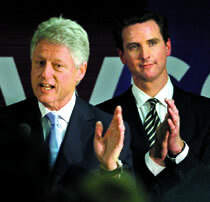 Bill Clinton has been a political ally of Newsom’s dating back at least to 2003, when he campaigned for him during his run-off against former S.F. supervisor Matt Gonzalez. Newsom later became a national co-chair of Hillary’s campaign (in which Hedayat served as a “Hillraiser”) and also spoke at a Clinton Global Initiative event last year. In April, while back East on a fundraising trip, Newsom paid a call on Bill Clinton to discuss the governor’s race, and received a characteristically prolific raft of political advice from the former president, who considers himself the Democratic consultant-in-chief. When L.A. Mayor Antonio Villaraigosa, who also strongly backed Hillary Clinton, announced his decision not to run for governor two months later, “that set the ball in motion” for the endorsement, Calbuzz learned – and set the table for Hedayat to close the deal. The former president was already well-motivated, as we reported on Tuesday, because there has long been bad blood Clinton and Jerry Brown, Newsom’s chief rival for the Democratic nomination for governor. After Clinton was elected, Brown evolved into his full “We the People” populist identity, which included a radio show on which he regularly dumped on Clinton as a corporate tool. And in 1996, Brown famously punctuated a state Democratic party convention tribute to his father, the late Gov. Pat Brown, with a jeremiad in which he ripped Clinton – as well as Senators Dianne Feinstein and Barbara Boxer – for supporting a “fascistic” and “phony” anti-terrorism bill. Further alienating Clintonista party regulars, Brown in 1998 turned his back on Democrats entirely, later acknowledging that he voted for Ralph Nader **over Clinton veep Al Gore in the 2000 presidential campaign in 1996. He later re-registered as a nonpartisan independent to run successfully for mayor of Oakland. In fact, walking down memory lane, the only mystery is why Clinton didn’t endorse Newsom sooner. Crusty the General did note, as a matter of fact, that Clinton had endorsed Terry McAuliffe in the 2009 governor’s race in Virginia and that his candidate was beaten in the Democratic primary. **In an earlier version, we inaccurately reported that Brown endorsed Ralph Nader for president in 2000, a statement based on this widely-circulated story, which is in error. In fact, Brown voted for Nader in 1996, which he acknowledged on CNN in 1998. We criticize ourselves severely. Gavin’s having a good week – he just announced on twitter that he’s the father of a new baby girl. And let’s not forget that it’s with his wife–another win for the wandering prince. What you haven’t mentioned yet is that Bill Clinton is doing fundraisers like this all over the country for politicians who played big roles in his wife’s presidential campaign. Gavin was national co-chairman of Hillary for President, and campaigned extensively around the country boosting her and blasting Obama. As I mentioned last week, there are at least 10 politicians I know of getting this kind of Bill Clinton help, and a top Clinton hand tells me it’s more like 20. Now, Yashar Hedayat is a rich young guy from LA very active in gay rights. Our old friend Garry South knows him from his having been finance co-chair of the Steve Westly campaign.